Sony Online Entertainment LLC (SOE) today released the 21st expansion for EverQuest, The Darkened Sea. 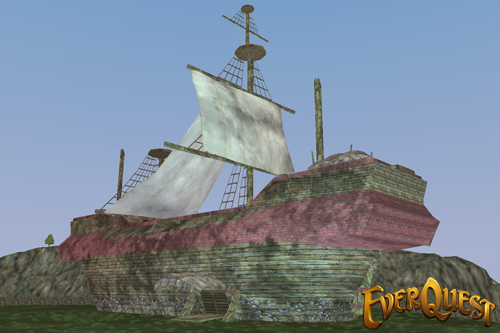 Continuing the “Year of EverQuest” celebration in honor of EverQuest‘s 15th anniversary, the latest expansion returns players to the lands of the Buried Sea. In The Darkened Sea, players will revisit familiar storylines and characters, and tread through both re-imagined areas and all new locales as they fight to return peace to Norrath. On a mission to restore balance to Norrath, heroine Firiona Vie travels to Katta Castrum, a city in the Buried Sea, to heal the Combine Emperor, Tsaph Katta. However, a corrupt splinter faction of the Combine, along with the treacherous Lanys T’vyl, attacks the city and kidnaps the Combine ruler. It is up to the heroes of Norrath to track down Lanys and her compatriots, rescue the Emperor and put an end to whatever designs Lanys has planned for Norrath. Arx Mentis – Residing on a tiny island deep within the Buried Sea hidden from view by fog and magic, this fortress serves as a base of operations for the followers of Seru. Brother Island – Home to an assorted group of pirates, merchants and other travelers, this safe haven keeps those who wish to cross the Buried Sea free from the lure of the sirens that plague its water… for a price. Caverns of Endless Song – Colorful caverns in an underwater cave system filled with dangling kelp, coral, shells and glittering sandstone. Its beauty is alluring, but many who venture in never make it back out. Combine Dredge – Once used to harvest resources from the depths of the sea floor, these mining platforms are now being used to raise sections of the seabed to find something… or someone. Degmar, The Lost Castle – A translocated dwarven castle lies at the bottom of the Buried Sea. While old in age, it sits in pristine condition protected by magical barriers that keep out vile sea creatures and keep in its many secrets. Katta Castrum – With its protective dome cracked and millions of gallons of seawater flooding the lower levels, the city finds itself under attack and its many treasures in peril from the Shissar. Tempest Temple – Ravaged by endless storms and wild magic, pieces of the island lay suspended in the air after the summoning of the ultimate storm. The entire ecology hangs in ruin, with the dangers of an unstable volcano at the center of the chaos. Thuliasaur Island – A remote jungle island to the south of the Buried Sea that is known for many more dangers besides its colossal dinosaur inhabitants. New spells, AAs, items, quests, missions and raids! “With The Darkened Sea, we wanted to revisit some of the classic stories that EverQuest has created over the past 15 years. By returning to the Buried Sea, not only can we revisit timeless areas in the world of Norrath, but also deliver the epitome of a classic ‘Good vs. Evil’ story to our fans, by bringing back two iconic EverQuest characters in Firiona Vie and Lanys T’vyl.” – Thom Terrazas, Senior Producer, EverQuest. Developer Allods Team and global publisher My.com, proudly announce Cybernetic Alliance, Skyforge’s newest update.